Is There a Shared Pathophysiology for Thrombotic Thrombocytopenic Purpura and Hemolytic-Uremic Syndrome? Thrombotic microangiopathy is characterized by microvascular thrombosis coupled with thrombocytopenia, hemolytic anemia, and red blood cell fragmentation. Familiar to nephrologists and hematologists alike, classically associated with thrombotic microangiopathy are the hemolytic-uremic syndrome (HUS) and thrombotic thrombocytopenic purpura (TTP), the histories and presentations of which are closely intertwined. Not surprising, these two disorders are considered by many to be manifestations of the same disease process, whereas others consider HUS and TTP to be distinct clinical and pathologic entities. Herein are reviewed HUS and TTP along with recent progress shedding new light on possible shared pathophysiologic mechanisms for these two intriguing disorders. Initially described in 1955 as a syndrome comprising renal failure, hemolytic anemia, and thrombocytopenia, hemolytic-uremic syndrome (HUS) is often considered to be a renal disease with systemic complications. Widespread deposition of microthrombi throughout the kidneys is thought to cause thrombocytopenia and microangiopathic hemolytic anemia in a manner analogous to TTP, although renal damage typically is more severe in HUS and systemic thrombosis may not be as widespread.1,2,4 Nonetheless, neurologic findings are common and, when present, greatly complicate the distinction from TTP. Although both disorders share a strong clinical and historical relationship, much recent investigation into HUS and TTP has followed independent and seemingly unrelated directions. TTP research has focused on regulation of the blood coagulation protein von Willebrand factor (VWF), whereas much HUS effort has been concentrated on understanding the mechanisms of injury to the renal endothelium. Although the subsequent events are less well understood, it is becoming clear that the mechanisms by which Stx induces the thrombotic state of HUS involve more than the direct toxic effects described. For example, Stx induces expression of proinflammatory genes in endothelial cells and leukocytes, upregulates expression of adhesion molecules, and can directly activate platelets.8,9 In addition, after STEC infection, prothrombotic coagulation abnormalities that precede clinical evidence of renal damage can be detected.10 The end result of these and, undoubtedly, other mechanisms is a shift in the hemostatic balance of the renal circulation toward thrombosis and TMA and the subsequent development of renal injury and clinical HUS. Although approximately 90% of HUS cases result from infection with STEC, much insight into the pathogenesis of HUS has been gained from investigations into diarrhea-negative, or “atypical,” HUS (aHUS), which accounts for approximately 5% of HUS cases.8 Insight into the pathogenesis of this disorder stemmed from observations that occasional patients demonstrated severely reduced serum levels of complement factor C3, suggesting systemic complement activation.8 It is now known that approximately 50% of patients with aHUS carry a heterozygous mutation in one of four genes encoding complement factor H, complement factor I, complement factor B, or membrane co-factor protein.8,11,12 These proteins function to control complement activation on cellular surfaces and therefore to limit complement-mediated damage to host tissues. Thus, a decrease in their activity results in the loss of ability to suppress complement activation throughout the body. However, for reasons that are only partially understood, the glomerular endothelium is especially sensitive to loss of complement regulation, and microvascular damage in aHUS principally is restricted to the renal circulation. If Stx can function to stimulate TTP pathogenesis in the setting of ADAMTS13 deficiency, then what about other HUS-related sources of endothelial injury, such as complement dysregulation? It is interesting that a recent report of two sisters with familial ADAMTS13 deficiency and TTP may shed some light on this matter.15 One of the two siblings experienced a clinical course typical of familial TTP with primarily neurologic disease and remains in relatively good health with plasma therapy. However, the other sibling demonstrated a much more severe course, with progressive renal deterioration and severe neurologic findings that culminated in her death from a cerebrovascular event at age 55. In addition to ADAMTS13 deficiency, this patient was found to have a heterozygous mutation in the complement factor H gene, which, interestingly, did not cause clinical disease in four other siblings. Thus, ADAMTS13 deficiency and complement dysregulation may have combined to produce a more serious phenotype than expected from either alone. Although requiring additional human and animal studies for confirmation, these new findings provide more support for the intriguing possibility that similar factors may trigger both TTP and HUS and that these two disorders may share some degree of overlapping pathophysiology (Figure 1). 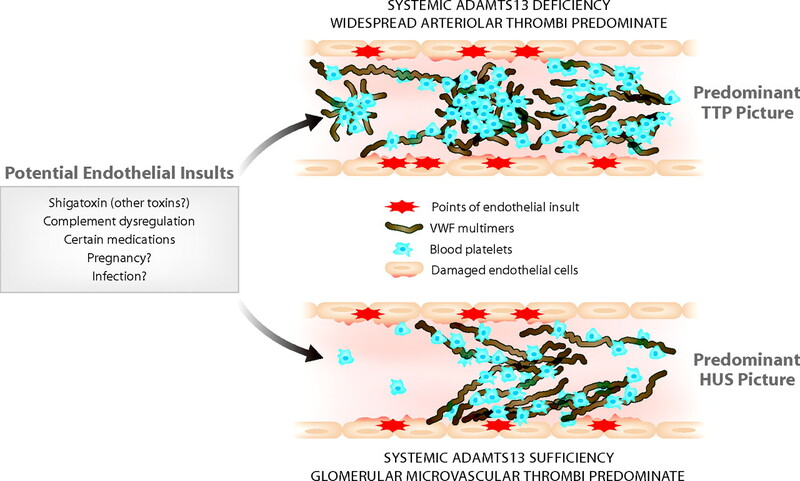 It is interesting to speculate that factors affecting ADAMTS13 and VWF activity may function to potentiate the endothelial injury seen in HUS and, conversely, that endothelial injury triggered by factors typically associated with HUS may be prerequisites for the TMA that is thought to result from ADAMTS13 and VWF dysfunction. At a minimum, it seems prudent to extend better the current TTP investigation to include mechanisms of endothelial injury and likewise to expand HUS research to reconsider ADAMTS13 and VWF as potential mediators of endothelial injury leading to TMA. It is likely that future research into these potential common mechanisms of disease will eventually explain the shared clinical findings of TTP and HUS with which we are struggling today. Hypothetical model for shared pathophysiology between HUS and TTP. In this proposed model, the inciting event for both HUS and TTP is a similar endothelial insult brought about by any of a variety of sources (or combination of sources) that results in widespread endothelial activation, inflammation, and damage, including the release of VWF and other contents of the Weibel-Palade bodies. The subsequent events may be determined in part by the level of systemic ADAMTS13 activity. In the case of systemic ADAMTS13 deficiency (top), ADAMTS13 is not available to process the newly released VWF, resulting in the widespread formation of VWF and platelet thrombi throughout the arteriolar circulation and the clinical picture of TTP. Conversely, in the case of systemic ADAMTS13 sufficiency (bottom), TTP is avoided by ADAMTS13-mediated release of platelet/VWF thrombi throughout the arteriolar circulation. For reasons that are not understood, circulating ADAMTS13 is not able to cleave efficiently VWF that is released in the glomerular microcapillary circulation, resulting in thrombus formation, increased inflammation, glomerular damage, and the clinical picture of HUS. Potential reasons for the inability of ADAMTS13 to cleave VWF in the glomerular circulation may include unfavorable shear stress not permissive for the proper unfolding of VWF (decreasing access of ADAMTS13 to the sessile bond within the folded VWF A2 domain) and the local presence of molecules that may interfere with ADAMTS13 activity or with its interaction with VWF. You are going to email the following Is There a Shared Pathophysiology for Thrombotic Thrombocytopenic Purpura and Hemolytic-Uremic Syndrome?